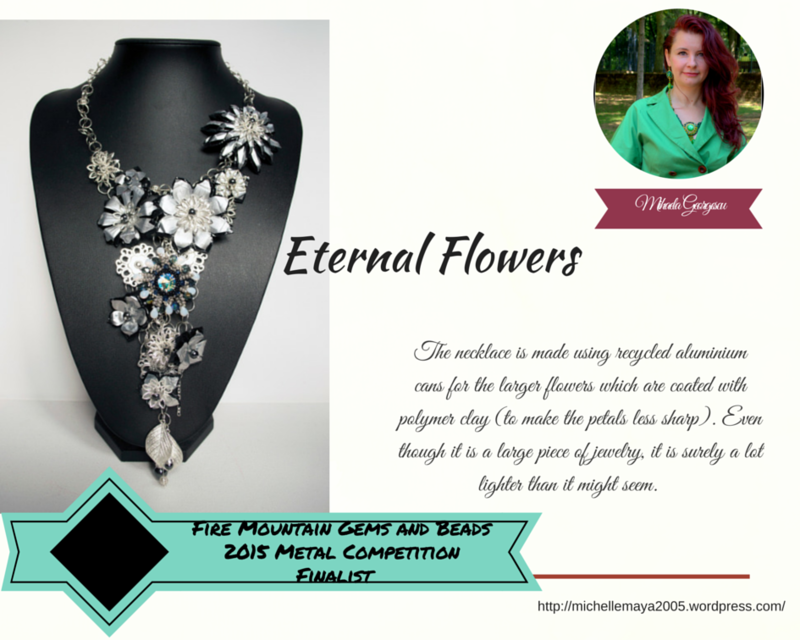 I am so happy to be once again a Fire Mountain Gems and Beads Finalist. This time it was for the Metal Competition. The requirements for this competition were to create a design using: metal clay, metal beads, wire, chain, jumprings or findings. Needless to say that I wanted to make something really special for this competition. 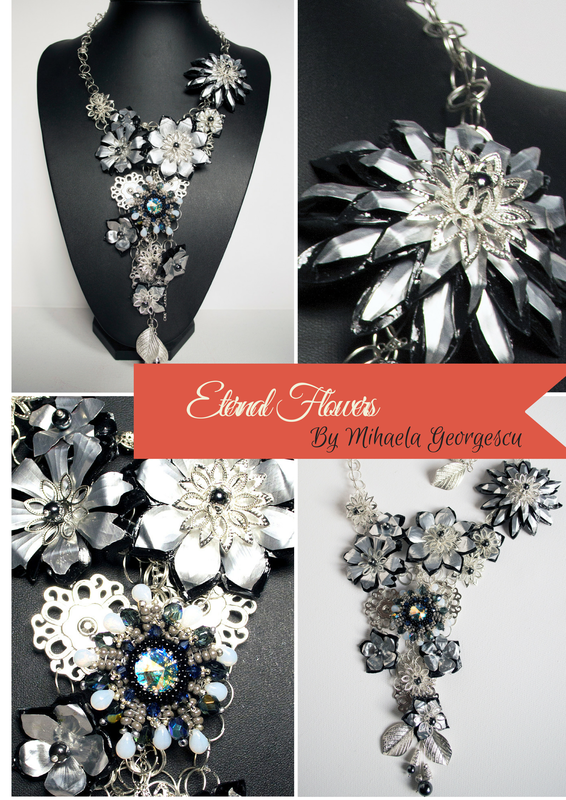 Then I remembered that I always had in mind to create a necklace with flowers made of recycled aluminium cans. I always keep the soda or the beer cans (I also use them as support for polymer clay bracelets when I bake them) so I had plenty of aluminium cans to cut and shape into petals and to assemble into flowers. The margins of the petals were a little bit sharp so I though it would be a good idea to coat them with polymer clay. I tried also to color the petals with alcohol inks (and the result wasn’t bad), but I preferred the silver look of the raw aluminium. It wasn’t really hard to cut and shape the petals, but I had to be very careful not to cut my fingers:) I have also used jumprings, findings, memory wire to make sure I meet the contest’s requirements. To add a little bit of glamour to the necklace, I placed a beaded rivoli flower to act as a focal on this slightly off-set necklace. Even tough it is a made mostly of recycled aluminium it does not have a cheap look (in my opinion) and I must say that I love the combination of recycled aluminium cans and polymer clay and I will surely use it in other designs. Congratulations on your recognition for this wonderful piece. I love it! the asymmetrical format was perfect to show off the variety of shapes you created, and the embellishments you added really gave the piece a nice POP of color! Well done. Congratulations Mihaela. It is very beautiful ! And what a work ! I imagine how much time it had take to do it ! You have great taste and talent and a lot of patience. But a proverb says : When one loves, one does not count! One more time congratulations Mihaela ! Best wishes to you. Lise. Asimetria florala din dreapta sus, umple de continut intreaga compozitie. E ca dopul unei sticle de sampanie, care promite o efervescenta a metalului incremenit. Iti tin pumnii stransi! Absolutely gorgeous! I wouldn’t even begin to know how to make anything close to this. Dear Lori, it surely looks more complicated than it really is. In fact it is very easy to cut out forms from aluminium cans (I have drawn the flower shape and cut it out using scissors). 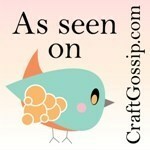 Thank you for the blog hop and for helping artists get together and admire each other’s work! You are a very talented artist and a wonderful person! Congratulations! 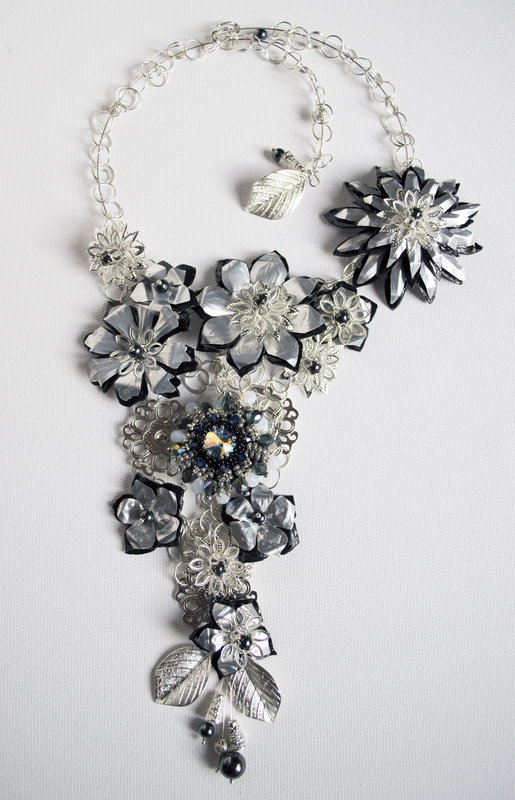 This is a beautiful piece very creative statement necklace. I love the idea of using the metal cans for the flowers. I made cans flowers in the past but I never used them in my jewelry! Beautiful! Congratulations! Your work is stunning, very creative and unusual! You are extremely talented. Do you have an Etsy Shop? It’s very reasonable to start up an Etsy Shop. You could easily sell your beautiful creations.